Search Pinterest, Twitter and Facebook and you'll see that family reunions are one of the most popular events of the year. If you need help getting your event off the ground you'll need to check out the tips herein. 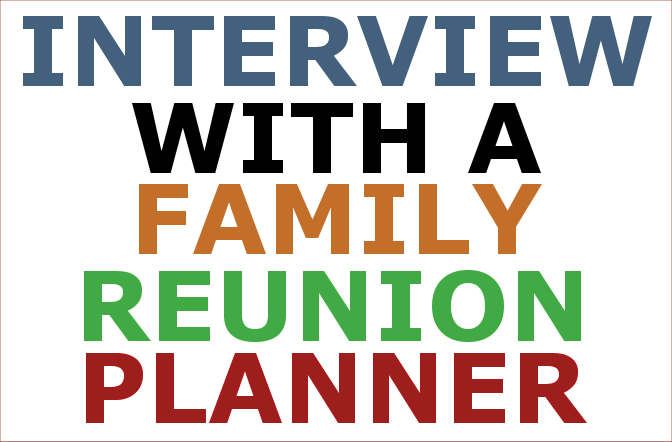 The developer of Fimark's Family Reunion Planner Social and Author of Fimark's Family Reunion Planner Keepsake Guide ebook was interviewed about the 3 things you need to know before planning your next family reunion. Here's Part 1 of the interview I hope you'll find helpful - I'll post Part 2 Saturday Morning. What is your #1 piece of family reunion planning advice? The first step in planning your family reunion is getting family members on board and committed it having one. As explained in great detail in the book and web app, get the family involved in the planning process as early as possible. Start with the question? What would be a good theme and activities for our next family reunion? The book presents five fascinating themes complete with activities you can suggest to get everyone involved. The book and web app contains tips, templates and worksheets for sending out surveys to narrow down the theme and activities most will enjoy. How do you establish a reunion tradition and get family members to count on and plan for the reunion each time? Be open to suggestions and solutions. This is important to the process of event planning because as I point out in " Fimark's Family Reunion Planner Keepsake Guide ebook", those who make the more practical suggestions should be considered when assigning volunteers to head up various departments. When considering the theme, activities and location, get everyone involved by including activities everyone will enjoy. Find more information about the Fimark's Family Reunion Planner Social web app from the link on this blog page.